Although he is one of the most distinguished Irish composers of his generation, Seóirse Bodley’s music is still largely under-represented in the catalogue. I can only mention a Marco Polo disc with his Fourth and Fifth Symphonies (8.225157). There also exist some long-deleted LPs, but I have never been able to lay hands on them. So, this release is most welcome. As can be seen from the above details, the three works recorded here span some fifteen years of his long and busy composing life, thus shedding light on his stylistic progress over these years. The Symphony No.1 for Chamber Orchestra is a fairly early work. It is also often referred to as Chamber Symphony No.1 - there is a second dating from 1982. This substantial piece is scored for a small mixed ensemble of eleven players: string quartet, flute, bassoon, horn, harp, piano and percussion/two players. Of the four short movements the elegiac third is particularly beautiful. The musical idiom in this early work is comparatively modern either freely tonal or dodecaphonic or combining both. It nevertheless displays a remarkable level of invention and the scoring for small mixed ensemble is resourceful. 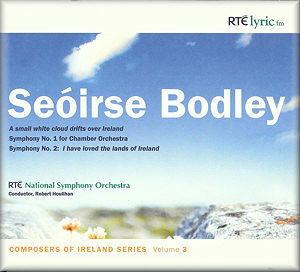 A small white cloud drifts over Ireland is really a symphonic poem. “Ireland is viewed as if from the perspective of a small white cloud” (the composer’s words). You might say that this is Ireland seen through Google Earth. The three sections of the work are played without break, each of them roughly based on Celtic music, albeit newly-composed, thus a jig and a reel in the outer sections framing a slow air. This colourful piece can best be described as a kaleidoscope in which different musical techniques collide: tonal chords, clusters, angular phrases and allusions to Irish folk music. The Symphony No.2 “Ro grádaiges íatha Ėirenn” (“I have loved the lands of Ireland”) is a large-scale work commissioned by the Irish government in commemoration of Pádraig Pearse. The work is in seven movements, whose titles are taken from early Irish sources, evoking “Irish reality, myth and Irish experience”. Movements I (“The sun shines through the windows”) and VI (“The Blackbird”) are expressions of Irish reality. Movements II (“Exile”) and IV (“Love”) suggest Irish experience whereas Movements III (“Aisling I : Morrigan”), V (“Aisling II : Cuchulainn”) and VII (“Aisling III : Banba”) clearly represent Irish myths. As might be expected, the first movement is full of light, and the music dazzles and shimmers. Although exile has been a dramatic occurrence in Irish history, the second movement rather concerns itself with recollections of home and feelings of longing expressed in long, folk-inflected melodic lines. Harsher episodes briefly disrupt the melancholy, nostalgic music that makes up most of this movement. The third movement (“Morrigan”) is, appropriately enough, a devilish, at times ironic Scherzo: Morrigan is the Queen of Demons. In the fourth movement (“Love”), the music speaks for itself and is often quite delicately scored. The next movement (“Cuchulainn”) tells of heroic deeds and does so with bright Waltonian fanfares, battling timpani and much vigorous writing while still allowing for calmer, more melodic episodes. The sixth movement (“Blackbird”) is a miniature tone poem whose main theme was anticipated in the second movement (“Exile”). The final movement is the longest of all and, to a certain extent, a recapitulation of earlier thematic material. In the 18th century aisling, Ireland appears in the guise of a beautiful woman Banba. A vigorous introduction leads into the main movement in which a softly played folk-inflected tune reminiscent of the fourth movement (“Love”) and material from Aisling II (“Cuchulainn”) alternate. After a good deal of thematic dialogue, the music reaches a climax with an intense version of the Banba theme. Then, the music “holds its breath” to a solo violin and a restatement of some of the opening rounds off the symphony. Bodley’s colourful Second Symphony is a very attractive and endearing work, and I am sure that this newly released recording will earn it new friends, for this is Bodley at his most straightforwardly communicative. It certainly deserves more than the occasional hearing. These recordings from the RTÉ’s archives are excellent and so are the performances. This beautifully produced release is most welcome for Bodley’s music has been neglected for too many years. It is to be hoped that more will follow. This music is far too good to be ignored.